In stock -This product will ship today if ordered within the next 2 hours and 3 minutes. MSM helps maintain healthy, flexible joints and muscles. Best MSM and Best MSM Powder contains pure MSM (methylsulfonylmethane), a white crystalline substance that occurs in the human body and in some foods. MSM is an excellent dietary source of bioavailable organic sulfur. MSM supports maintenance of strong, healthy body tissues. 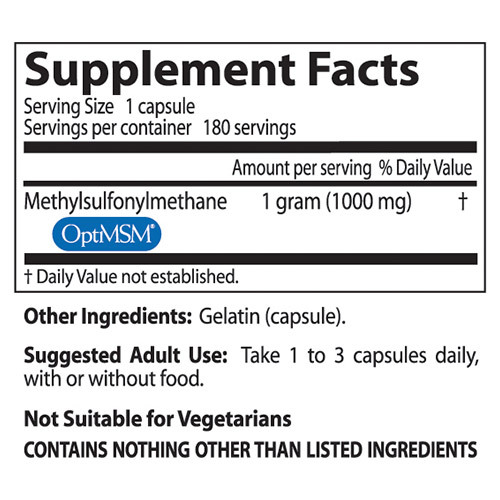 MSM supports normal gastrointestinal function. MSM supports mental alertness and maintenance of healthy mood. MSM supports normal lung function. MSM supports normal relaxation of muscles. MSM supports normal joint function. MSM helps maintain healthy skin. The human body requires a continuous supply of usable sulfur, and MSM is one of the primary organic sulfur-containing molecules for use by living organisms. From life`s earliest beginnings, primitive marine organisms (blue-green algae and phytoplankton) have absorbed inorganic sulfur from ocean waters and produced organic sulfur molecules, primarily dimethyl sulfonium salts. These salts are released back into the sea, where they are converted to dimethyl sulfide, which readily evaporates, ending up in the upper atmosphere. Dimethyl sulfide is then oxidized by UV light, forming DMSO and MSM. The two compounds are delivered to land masses in rain water, and absorbed by plants. MSM is a stable end-product of this process, and thus serves as a primary source of sulfur in the food chain. Take 1 to 3 capsules daily with or without food. 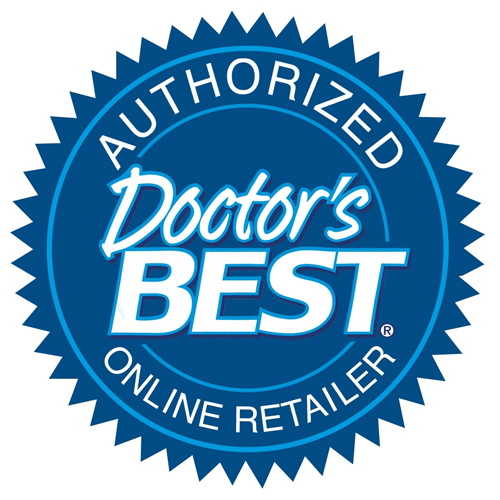 Below are reviews of Best MSM - 180 x 1000mg Capsules by bodykind customers. If you have tried this product we'd love to hear what you think so please leave a review. Convenient size to swallow. MSM seems effective in relieving aching joints. Great for joints, reduces allergies and seems to help with some food intolerances! Wouldn't be without them! I only ever associated MSM with joints and hair. This is the first time I have taken them right through the summer and couldn't understand why I had no allergy problems. No tablets, eye drops or nose drops. Even when it would normally be at it's worst. After reading the other reviews I must admit agreed with them. This is a good product and my favourite. 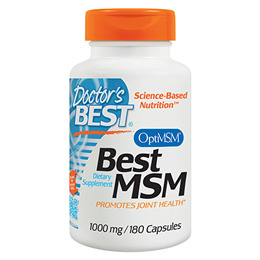 MSM is a number one best seller because it helps maintain healthy, flexible joints and muscles. MSM is also good for maintaining strong hair and nails, and beautiful skin.